Hassan is a diabetes patient who was displaced to Hutheima in February 2015. "There were mortar attacks and shelling, he recalls, it was all so terrifying, we all fled, my family and I together with the entire village. We found an empty home here in Hutheima that belongs to someone who fled to Mosul during the fighting, I just know his name. In Iraq, the humanitarian situation continues to deteriorate as people displaced from their homes by violence face their third summer living in harsh conditions. Meanwhile more people are being forced to flee their homes as a result of renewed fighting. The humanitarian crisis is being fueled by the conflict in the region and magnified by political instability and a severe economic crisis, which is further eroding Iraq’s fragile infrastructure and crumbling services, already weakened by years of violence. The number of people affected by the ongoing conflict continues to rise, with more than 3.3 million Iraqis now displaced throughout the country, which is causing an increasing strain on already destitute host communities. In addition to this, Iraqi Kurdistan is hosting a further 250,000 refugees who fled Syria from 2012 onwards. People’s humanitarian needs are most urgent in the areas outside Iraqi Kurdistan, but the international response in these areas is severely hampered by a very volatile security situation. In addition, state actors have mainly focused on carrying out military—rather than humanitarian—interventions, resulting in yet more people being displaced from densely populated areas. In those areas which have been retaken by Iraqi forces, including Tikrit, Diyala, Ramadi and parts of Ninewa governorate, displaced people are being encouraged to return to their homes. However, most towns and villages suffered high levels of destruction during the conflict and now basic services are only partially covered, while reconstruction is not yet underway. For displaced people living in unstable areas, often close to the front lines, accessing health care is becoming increasingly difficult. Travel through highly militarized areas requires a permit, while hospitals across government-controlled areas are now charging patients to access their services, putting them out of the reach of people who have lost their livelihoods, cannot find work and have exhausted their savings. 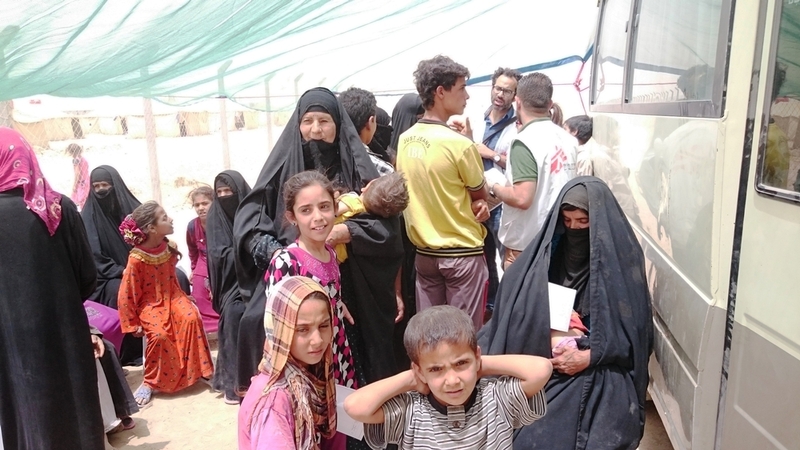 MSF has been steadily increasing its response, with teams of both Iraqi and international staff working in a growing number of locations across 11 governorates to provide free-of-charge basic health care, mental health services and essential relief items to displaced families, returnees, impoverished host communities and Syrian refugees. MSF is using a flexible approach which allows it to deploy mobile medical teams according to population movements and people’s needs, with a focus on those who cannot access medical care because their movements are restricted or because they lack the financial means to travel or pay for services. Our medical teams can also provide patients with crucial referral documents for hospital treatment to enable them to travel through highly militarized areas. MSF is also increasing its capacity to provide mental health first aid to a growing number of patients who have been traumatized by recurrent violence and who have been surviving in harsh conditions for months and even years at a time, as well as living in fear and facing an uncertain future. In militarized areas close to the frontline in Ninewa governorate, where fighting has resulted in the destruction of most of the medical infrastructure, MSF mobile teams are providing general health care and mental health services to displaced people, returnees and destitute local communities. Other MSF teams are providing similar services in several locations between Kirkuk and Tuz Khurmato. After military operations started in March in Erbil governorate’s Makhmour district, south of Mosul, MSF has increased its medical and mental health services to cover the needs of a new wave of displaced people. In Diyala governorate MSF has been working in camps around Khanaqin, and in towns such as Jalawla and Saadiya, by providing a mix services that varies from health promotion, mental health, reproductive health and primary health care, community outreach and psycho-social educational services and water and sanitation projects. An MSF team is also assisting health authorities in Saadya hospital’s emergency room and the primary health care center with chronic disease management, mental health services and health promotion activities. In Karbala, Najaf and Babil governorates, MSF runs mental health programs for displaced people in 14 different areas, providing psychological care to people living in, and outside of camps. 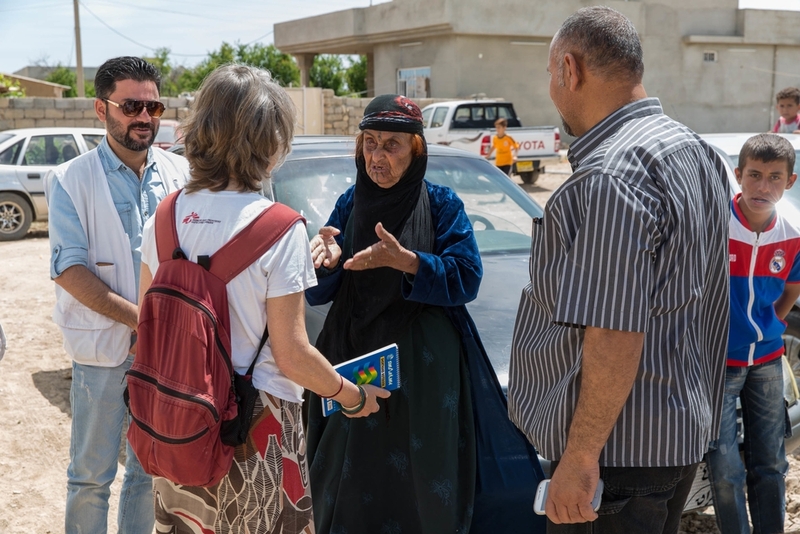 MSF has also carried out distributions of emergency relief items such as blankets, mattresses and hygiene kits to recently displaced families in Karbala and Babil governorates. MSF teams also supported distribution of drinking water to displaced people in Karbala camp using a system of tuktuks and vouchers. In response to the massive needs in Baghdad governorate’s Abu Ghraib district—an impoverished and unstable area west of the Iraqi capital, where some 25,000 displaced families are staying and many others are arriving from Fallujah—MSF has stepped up its year-long medical activities, with the opening of a fixed clinic in February. Another medical team is providing basic health care at Bzeibiz Bridge, on the border with Anbar governorate, to 7,000 people living in camps. MSF teams is also currently deploying mobile clinics to provide basic medical services to the displaced families fleeing Fallujah. In Sulaymaniyah governorate, MSF is collaborating with the health authorities in Sulaymaniyah emergency hospital providing hands-on training to improve the quality of medical services in the intensive care unit and the emergency trauma ward, and with incentive payments to fill the staffing gaps. In Diyala governorate’s Jalawla hospital, one of the region’s main health facilities, which has been badly damaged by fighting, an MSF team has carried out work on the building’s water storage system and electrical wiring. MSF is also continuing to assist the Sheray Naqib women’s hospital in Kalar by providing medicines and incentive payments, after providing a three-month intensive training to midwives and delivery room staff. MSF is continuing to provide treatment for chronic diseases, mental health care and sexual and reproductive care to Syrian refugees in Domiz camp, Iraqi Kurdistan, as well as insuring a safe place for women to give birth in its maternity unit, opened in 2014. MSF psychologists and psychiatrists are also making mental health services available to Syrian refugees in Kawargosk, Gawilan and Darshakran camps. Since August 2006, a network of Iraqi doctors has been referring victims of violence from all over Iraq to MSF’s reconstructive surgery hospital in Amman, Jordan. The surgical team specializes in highly complex surgery requiring multiple stages of treatment, in particular maxillofacial surgery (dealing with the head, neck, face, jaw and sinuses), orthopedic surgery and surgery for patients with severe burns. Patients also receive physiotherapy and psychosocial support. Al Shuada clinic in Abu Ghraib, Siada has just been given the news by an MSF doctor that she is pregnant. “I have seven children and this one will certainly be the last one,” she says. Since their arrival in Abu Ghraib several months ago, the family has been living in a dilapidated house. “With no income and no job, we ended up selling most of my jewelry to pay for the rent and repairs to the roof,” says Siada.